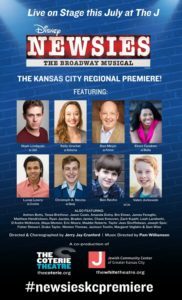 Kansas City, MO – The Coterie Theatre and The White Theatre at “The J,” the Jewish Community Center of Greater Kansas City, will “Seize the Day” with their co-production of Disney’s Newsies, which opens for a limited run on July 7 and continues through July 29. The show will mark The Coterie and The White Theatre’s first collaboration, as well as the Kansas City region’s first production of Newsies that is being locally produced. This show features a cast of all-local professional and non-professional adult and youth actors, and will be performed live on stage at The White Theatre at The J, 5801 W. 115th Street, in Overland Park. The show is directed and choreographed by Jerry Jay Cranford, who brings a wealth of experience and expertise to the project, with acting, dancing, choreography and directing credits from Kansas City to New York City. 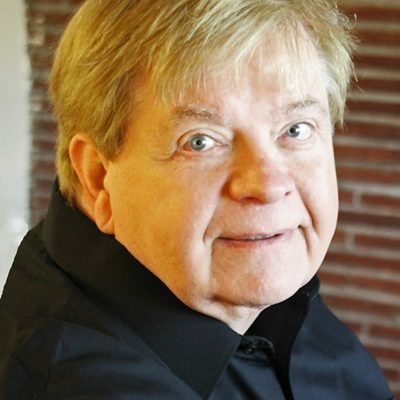 Musical direction is provided by Pam Williamson, a veteran of 10 musicals at The White Theatre. Set in New York City at the turn of the century, Disney’s Newsies tells the rousing tale of Jack Kelly, a charismatic newsboy and leader of a ragged band of teenaged ‘newsies,’ who dreams only of a better life far from the hardship of the streets. But when publishing titans Joseph Pulitzer and William Randolph Hearst raise distribution prices at the newsboys’ expense, Jack finds a cause to fight for and rallies newsies from across the city to strike for what’s right. Newsies features music by eight-time Academy Award® winner Alan Menken (Disney’s Beauty and the Beast, Disney’s Aladdin, Sister Act), lyrics by Jack Feldman, and a book by four-time Tony® Award winner Harvey Fierstein (La Cage aux Folles, Torch Song Trilogy). Originally written for the 1992 feature film musical, Menken’s stirring score is often credited for the cult following Newsies has developed since its initial release. The multiple Tony® Award-winning stage production of Newsies, which ran on Broadway from 2012-2014, adapts many of Menken’s memorable melodies, including “Carrying the Banner,” “King of New York,” “Santa Fe,” and “Seize the Day,” and expands the score with new songs that help tell the inspiring real-life story of the ‘Newsboy Strike of 1899,’ when newsboy Kid Blink led a band of orphan and runaway newsies on a two-week-long action against Pulitzer, Hearst and other powerful newspaper publishers. The Coterie & The J’s co-production of Disney’s Newsies will run approximately 130 minutes with one 20-minute intermission and is perfect for families with children ages 7 and older (parent discretion is advised). Tickets for Disney’s Newsies are $25 for the general public, $18 for J Members and $14 for students. Group discounts and season tickets are also available. You can purchase your tickets online at TheWhiteTheatre.org, contact The White Theatre Box Office at (913) 327-8054 or by email, boxoffice@thejkc.org, or visit the box office in person at 5801 W 115th St, Overland Park, KS, 66211 from 10 a.m. to 2 p.m. Tuesday-Friday and one and a half hours prior to all performances. Designated by TIME magazine in the top three theaters for young audiences in Nov. 2004 (“groundbreaking…one of the nation’s most respected”), The Coterie has been at the forefront of commissioning new works or adaptations that contribute to the field of theatre for young audiences. More than 50 world or American premieres for all ages have been produced by The Coterie over the last 25 years, during Artistic Director Jeff Church’s tenure, including hosting multiple major Broadway composers and lyricists to shape quality musicals for youth and families. The Coterie is interested in intergenerational conversation, and consistently includes teen programming in its season and outreach efforts. The Coterie’s community programming redefines traditional notions of work for young audiences with its unique dramatic writing programs, teen LGBTQ work, as well as its AIDS/STD education/prevention program, free of charge to 8,000 teens per year, overseen by Executive Director Joette Pelster and a dedicated staff. All these components serve an average of 80,000 per year through over 350 performances. The Coterie also offers acting classes year-round at multiple locations throughout greater Kansas City. Information available atTheCoterie.org. The non-profit Lewis & Shirley White Theatre at The J, built in 2005, is a 500-seat, state-of-the-art facility, featuring the latest amenities in terms of seating, sound and lighting technology, and regularly hosts a mix of top talent from the region and around the world. Called “the best kept secret” in Kansas City’s theatre scene, The White Theatre’s mission is to provide enriching, thought-provoking entertainment that builds on Jewish cultural values, enhancing wellness, meaning and joy for people of all cultural backgrounds. Established more than 100 years ago, the Jewish Community Center of Greater Kansas City, “The J,” provides a warm welcome to families of all backgrounds. “The J’s” all-in-one hub for health, learning, and well-being elevates the lives of the community and its Members with programs of excellence in fitness, sports, theatre, cultural arts, senior adult programming, and youth services including summer camps and child development. Everyone can “live up” at “The J,” located in Overland Park, Kansas, and at TheJKC.org. Due to the nature of live theatre, play selection, performance schedule and casting are subject to change.